When I first started chasing marten in the Rocky Mountains, I laid out walking traplines in 5-mile loops. As the winter snow piled up, I strapped on snowshoes and soon found it necessary to attach crampons to navigate the steep, icy sections of trail. When the snow pack got so deep I couldn’t get the truck to the trail heads, 5-mile walking loops became 10-mile loops. Hiking 10 miles in the summer takes me about five hours. That time easily doubles in deep snow. I decided a snowmobile might leave me with more time to actually trap and borrowed one to try it out. I made a snowmobile sled from a plastic ice-fishing sled by drilling holes through the lip just big enough to run cotton rope through. I cut a section of 1-inch PVC pipe and slid it over the rope. The pipe worked like a tow bar, stopping the sled from sliding into the machine when I stopped. The sled also tracked much better. Like any trapper, I am always looking for things to make the job easier and more profitable. 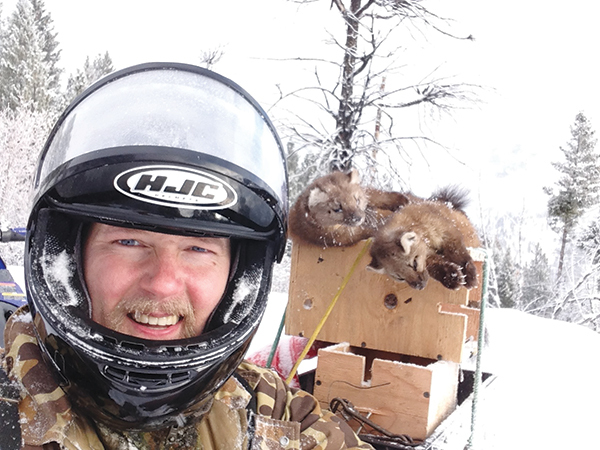 After trapping three times as many marten as I had the previous season on foot, I bought my own snowmobile. This not only increased the catch but also opened up new areas that were simply inaccessible on foot. As the seasons rolled on, other trappers moved into some of the areas I trapped but always stayed close to the trail heads. They typically trapped for a week or two and then moved out. Some were on foot and others were on snowmobile, but they all seemed to be looking for the “easy” marten close to the road. The few trappers I met back in the mountains asked where I was trapping, and I did likewise so we could avoid setting too close to each other. This made for a better trapping experience, and as I ventured farther into the high country, the number of trappers I saw dwindled to zero. My first marten sets were simply bait tacked to a tree 18 inches above a No. 1-1/2 foothold on a leaning pole just below the trap. But it was tough to find good poles as the snow pack deepened, and after snow and freezing rain put the traps out of commission too many times, I quit using that set altogether. Now I set 120 bodygrips under weatherproof boxes, and I have never seen where a marten hit the trigger wires without the trap firing. Bodygrips also make an instant kill. It just makes sense to use them instead of foot traps. I build the small boxes so they are easy to stack, allowing me to carry more into the mountains. I always carry extra traps when checking the line, because a caught marten is usually frozen in the bodygrip. I take the frozen marten and trap home together to thaw out. I remake the set with a new trap. I soon noticed that boxes slanted down or mounted vertically close to the ground worked best and several times saw tracks where a marten approached but then did not climb the tree to get at a more-elevated box. It also became obvious that when the bait was visible, the marten was more likely to commit to the set. My boxes had a shelf inside to hold the bait, but at times, the bait still wasn’t visible from the ground. Guy, a trapper friend, solved this problem by cutting old onion sacks into squares, wrapping these around the bait and then tying them off to form balls of bait. He rolls the bait balls and freezes them until needed. At the bottom of each marten box, he drills two 1/4-inch holes about 2 inches apart. When it’s time to use a bait, he simply pokes 8 inches of heavy wire through the bait ball, bends the wire into an “S,” and runs the long end of the wire through the two holes. This lets him suspend the bait squarely in the middle of the box, securely in place. 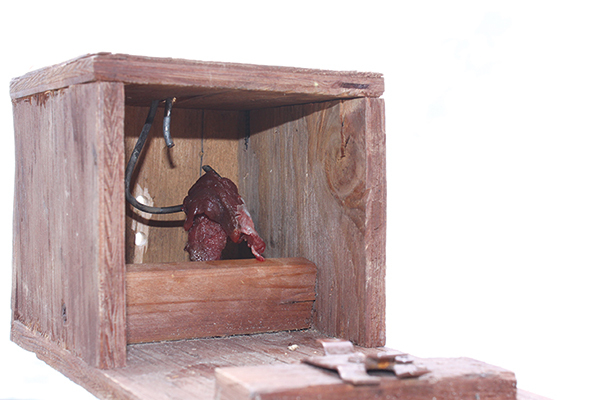 I modified the idea by poking heavy wire through chunks of beaver meat and hanging those inside my boxes. Since my boxes aren’t always vertical, I drill the wire-hanging holes in three sides of the box. That way, I can always hang the meat in a manner that makes it easy to see, regardless of the final position of the set box. Another good marten trapper named Paul told me about rubbing a muskrat or beaver carcass up and down the trunk of the tree just below the box to leave a scent trail, an aromatic pathway right to the trap. I like to start the scent trail several yards from the tree to mimic a marten dragging prey across the ground and then up into the tree. I learned about cutting short pieces of mullein stalk and pushing them over the trigger wires from a trapper who believes marten just don’t like pushing their noses against cold steel. I don’t know about that, but the number of near-misses dropped noticeably. Talking with other trappers is a great way to pick up little tips and tactics. Individually, they may seem minor, but the accumulative effect can greatly increase the catch. Fresh or slightly tainted beaver meat soaked in skunk essence and glycerine won’t freeze and will pull marten in from farther away. I also use fish parts and fish oil. Until temperatures drop far below zero, this alone will draw in marten and fisher. For added assurance, I dab skunk essence or gusto on a cotton ball and hang that on a branch above the set where the breeze may disperse it. I may freshen the lure every week or so, but if I can smell it, I don’t bother. When the weather stays right and sets are working as designed, local marten populations are susceptible to overharvest. When the number of females increases to more than a third of the catch, it’s time to pull out of the area. The best marten trappers are vigilant about this, ensuring that their lines stay productive for years to come. It also is important to scout throughout the season for new areas to move to when you do pull a line. I focus on distant draws and ridges, but wherever marten tracks cross a trail may lead to a great location. A typical marten home range is less than 2 miles square, which means that moving just 2 or 3 miles puts you on new animals. After a fresh snow, I like to ride out into new territory and note the amount of marten tracks I see. Of course, exploring new areas also increases the risk of getting the snowmobile stuck. 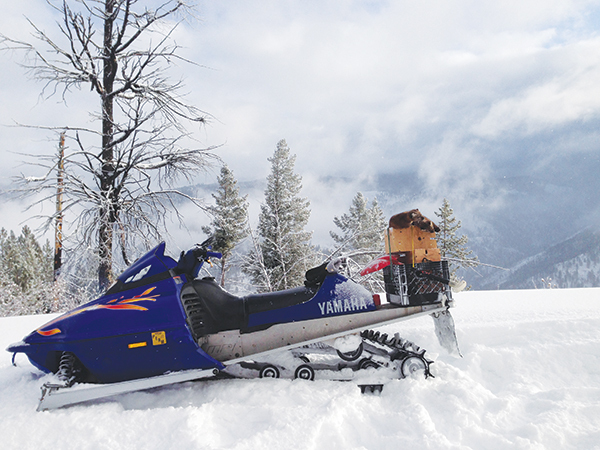 My first year trapping on that borrowed snowmobile, I made it to the top of a pass along the Montana/Idaho border the day after it had snowed 5 feet. As I turned around, the snowmobile track sunk in deep snow. I jumped off to lift the snowmobile up, and an instant later I was looking up at the snowmobile! It took 10 minutes just to get back on the machine and then another hour to dig it free enough to power out of the powdery fluff. A snow shovel can be a lifesaver on a high-country marten line. It’s also not a matter of if but rather when that machine will fail. After breaking down 5 miles from the truck and hiking out without snowshoes—just one time—I always carry ’shoes and also cross-country skis, ski poles and ski boots strapped to the snowmobile. A small pack stove along with ramen noodles and tea bags is also a good idea. It’s amazing how a cup of hot soup and a cup of steaming tea can improve morale after an hour or two spent digging out a snowmobile or trudging through deep powder. Last season, after only catching two marten in two weeks, I decided to pull the line and move to a new location. But as I pulled those traps, I collected three marten from the first six sets. I hadn’t changed a thing, but the weather sure had changed. When temperatures drop below zero and stormy weather rolls in, every critter in the forest holes up. If you scouted the area and saw plenty of marten tracks before the weather got nasty, be patient. Eventually, the weather will cooperate. Speaking of weather, you need to be dressed properly at all times. While snowmobiling last year in cold hovering around 25 below, air kept blowing in through the collar of my coveralls. I had forgotten my balaclava, so I just tucked my head down. But the cold still got in, and I could feel my neck swelling as I walked a 4-mile loop before riding 27 miles off the mountain. When I reached the truck and looked in the mirror, my swollen neck looked like it had been stretched across a barbecue grill. I suffered frostbite, and it took weeks to heal. Marten make up the bulk of my high-country catch, but on nearly every check I see the tracks of coyotes and fox that have followed my snowmobile trails and then turned to follow my boot prints. At one location, a coyote jumped up and stuck its nose in a marten box, trying to get at the bait. The trap snapped on its snout, and tracks in the snow told the story of that coyote wrestling with the trap and finally pulling out. I was mighty glad I had attached the trap securely to the tree with a 1-inch fence staple. When I told this story to a fellow named Bob who has trapped the backcountry for five decades, he laughed and told me that, over the years, he had caught and held two red fox in elevated marten sets. When the snow piles high, every animal utilizes the trails made by trappers, and a few snares set along the pathways from the main trail to the sets may add fur to the stretchers without much extra work. Even at 7,000 feet, I routinely see fox and coyote tracks into January and February. I also catch bobcats within spitting distance of marten sets. But bobcats are usually heading to the lower elevations by late December, as they migrate down to where the hunting is easier and cat breeding season is about to heat up. The high country never fails to challenge me. Nor does it fail to deliver excitement and a feeling of accomplishment as difficult situations are overcome. I know of nothing better than trapping a pristine wilderness with little if any competition, filling the fur shed with winter-prime mountain fur.